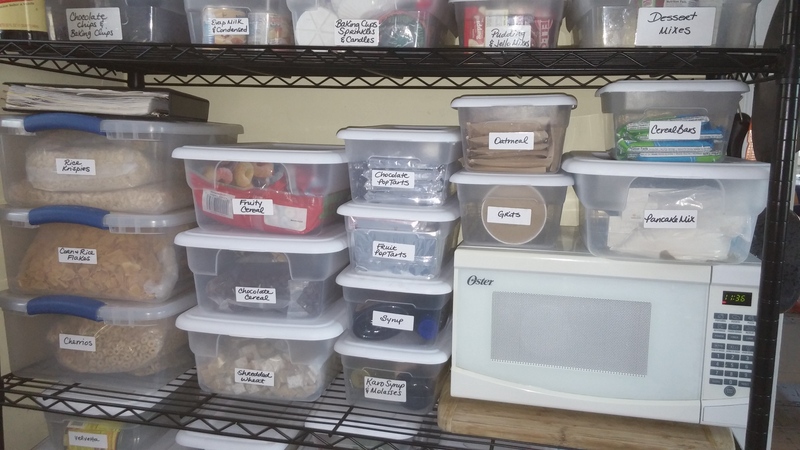 Organizing, procuring, and assembling the mass quantities of food that it takes to feed a large family……..or a small family if the Mama has ADHD and has a hard time keeping track of things…….can be a full-time job. And that’s if your organized. Having a system in place is the only means of surviving the chaos (and blessing) of having many mouths to feed. My system is in my pantry, and I am lucky enough to have a whole room dedicated to storing my food and laundry supplies. 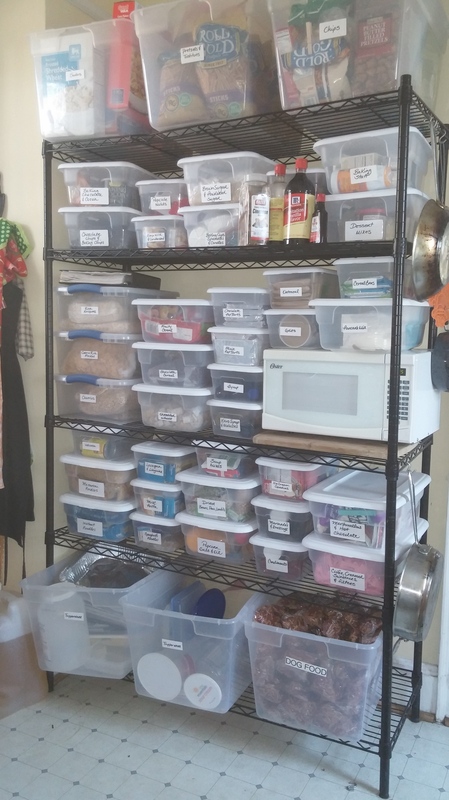 While some may view the following pictures of my ‘pantry-on-steroids’ as a tad OCD, I look at it as essential to my sanity…….as I am a mother of a large family and a Mama with ADHD. There are two metal shelves in my pantry that holds all of our staples and ingredients. I purchased one at Lowes for $90 and the other at a yard sale for $25. Lesson learned, and when I wanted to buy more of these amazing shelves for our garage, I waited until I found them on Craigslist. The top shelf is dedicated to extras, so when we run out of something, we have a small store in our top bins. Bin 1: Unopened boxes of cereal. Bin 2: Unopened bags of pretzels and tortilla chips. Bin 3: Unopened bags of chips and unopened boxes of crackers. The second shelf is my baking shelf, so all things associated with baking can be found in this one location. Bin 1: Baking chocolate and Cocoa – I keep 1 box of baking cocoa, 4 boxes of unsweetened chocolate baking squares, and 4 boxes of semi-sweet chocolate baking squares. Bin 2: Chocolate chips and baking chips – I keep 2 large Sam’s Club bags of chocolate chips, 1 bag of white chocolate chips, 1 bag of toffee bits, 1 bag of mini baking M&M’s, and 1 bag of peanut butter chips. Bin 3: Popsicle molds – the plastic kind. Bin 4: Baking cans – I keep 2 cans of evaporated milk, 1 can of sweetened condensed milk, and 2 cans of Dulce de Leche caramel. Bin 5: Brown sugar and powdered sugar – I keep 3 bags of each. Bin 6: Sprinkles, baking cups, and candles. 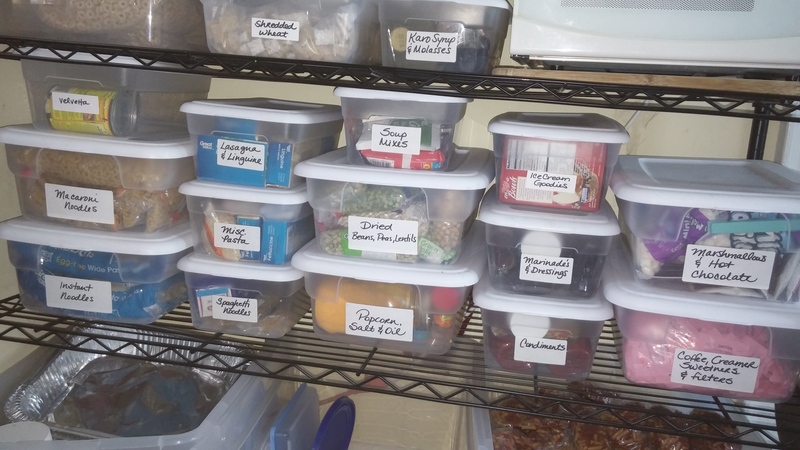 Bin 7: Baking spices and extracts – I keep a large cinnamon and ginger, regular nutmeg, allspice, ground cloves, cloves, cream of tartar, and food colorings. I make my own pumpkin pie and apple pie spices. I have almond, mint, lemon, maple, cinnamon, and real vanilla extracts. I keep a large Sam’s club imitation vanilla extract on this shelf as well. Bin 8: Pudding and Jell-O mixes. Bin 9: Baking Stuff – not a very sophisticated label, but it covers the basics. In this bin I keep 2 boxes of baking soda, 1 can of baking powder, 1 can of cornstarch, and 4 sticks of butter flavored vegetable shortening. 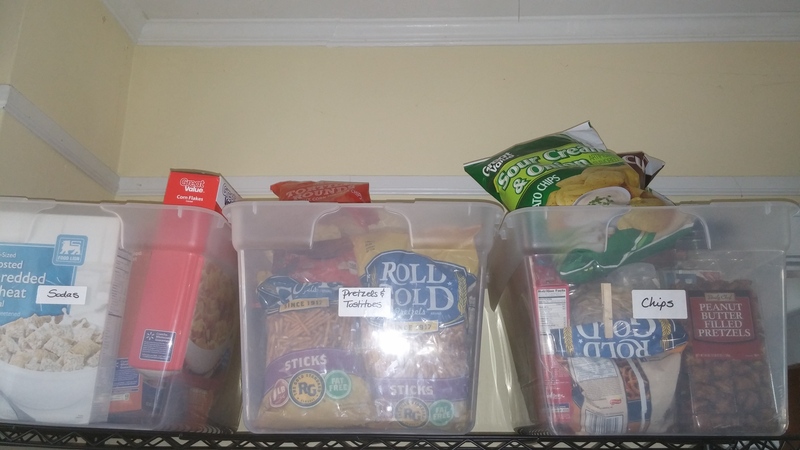 **We have lots of different preferences in my house, so we need six bins for our cereals. I don’t mind the little ones (and my oldest son!) having a sweet cereal once a week, but the rule is, once it’s gone, it’s gone! Same goes with Pop-Tarts. Bin 7: Chocolate Pop Tarts – 1 large box. Bin 8: Fruit Pop Tarts – 1 large box. Bin 9: Unopened pancake syrup – 2 bottles (opened bottle is kept in a kitchen cabinet). Bin 11 : Instant oatmeal – 1 box of brown sugar and 1 box of apples and cinnamon. Bin 13: Cereal bars – 2 box of apple grain bars and 1 box of strawberry grain bars. Dave and DJ will take these to work in the mornings, but the littles like them for a treat as well. Bin 14: Pancake mix – 3 bags of add-water mix, and 1 box of buckwheat mix. Bin 1: Velvetta and Rotel tomatoes – 1 box of processed cheese and 1 can of Rotel. Bin 2: Macaroni – I keep a big Sam’s Club box of macaroni in there, which comes in 5 1lb bags, but I also have 2 bags of pasta shells and 1 bag of rigatoni. Bin 3: Instant noodles – for a treat, my older ones love oodles of noodles. Bin 4: Lasagna and linguine – 1 box of lasagna and 2 boxes of linguine. Bin 5: Misc. pasta – baby alphabet pasta, penne, tri-colored pasta, and other pastas we need specifically for a special recipe. Bin 6: Spaghetti – 1 large Sam’s Club box of spaghetti noodles which comes with 6 1lb bags. Bin 7: Soup mixes – 4 pouches of onion soup mix, 4 bags of miso soup mix. Bin 8: Dried beans, peas, and lentils. Bin 9: Popcorn, popcorn salt, and popcorn oil – we use an air popper and an oil popper for our popcorn. Bin 10: Ice cream goodies – 1 bottle of chocolate fudge sauce, 1 bottle of caramel sauce, 1 bottle of hard shell chocolate and sprinkles. Bin 11: Marinades and dressings – unopened bottles. Bin 12: Condiments – unopened bottles of BBQ sauces and chili sauce. Bin 13: Marshmallows and hot chocolate – 2 bags mini marshmallows, 2 bags jumbo marshmallows, packets of cocoa mix, and a large bag of bulk cocoa mix. Bin 14: Coffee, sweeteners, and filters – I use a Kerig now for the most part, but when I am entertaining I will brew a large pot of coffee. I keep a large bag of coffee (simply for storage, as the coffee we use is kept in a canister in the kitchen), large bag of sweeteners (a canister in the kitchen has these as well), and coffee filters. 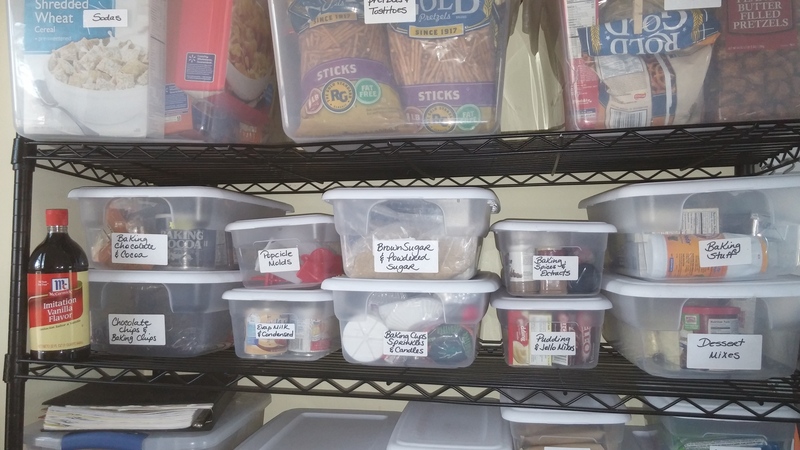 Bin 1: Food Storage – I keep foil containers in here that I will cook things in to give away……..casseroles and things for people who just had a baby, sick ones, or for a celebratory meal. 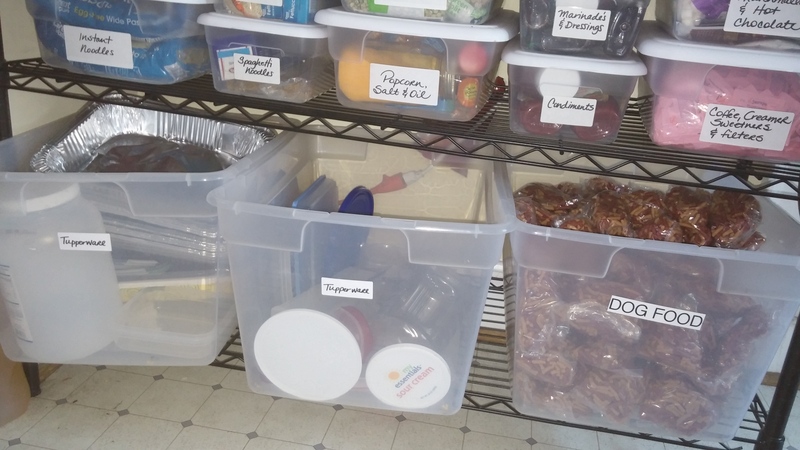 Bin 2: Tupperware – I actually only own a few Tupperware pieces, but in my house growing up everyone called storage containers Tupperware 🙂 So, this bin keeps all of our storage containers. Bin 3: Dog food – we had 3 dogs up until last month :-(, now we are left with 2…….even so, it takes a lot of dog food to feed these hungry guys. We use Moist and Meaty as the oldest two have (had) teeth problems and this food makes it much easier for them to chew. We buy 3 bulk boxes at Sam’s Club to keep on hand at all times. It is such an awesome feeling to have an up-to-date grocery list at all times, as once we use something, we just write it down on the list! Next up, I will show what I’ve got on the Right Shelf……..happy organizing!